SLVFD was notified at approx. 7:30 am by Saranac Lake Police Department of a doe through the ice on Lake Flower in the narrows. It is unknown how long she had been in the water struggling to get out and back on the ice shelf. At the request of the SLPD an SLVFD officer responded to the scene to access the situation. SLVFD notified NYSDEC of the situation who also dispatched additional rangers and NYS ENCON officers to assist. Deer falling through the ice is very common in the Adirondacks. Deer will often self rescue or eventually succumb to the elements. It is important to note that SLVFD normally does not respond to rescue a deer through the ice. 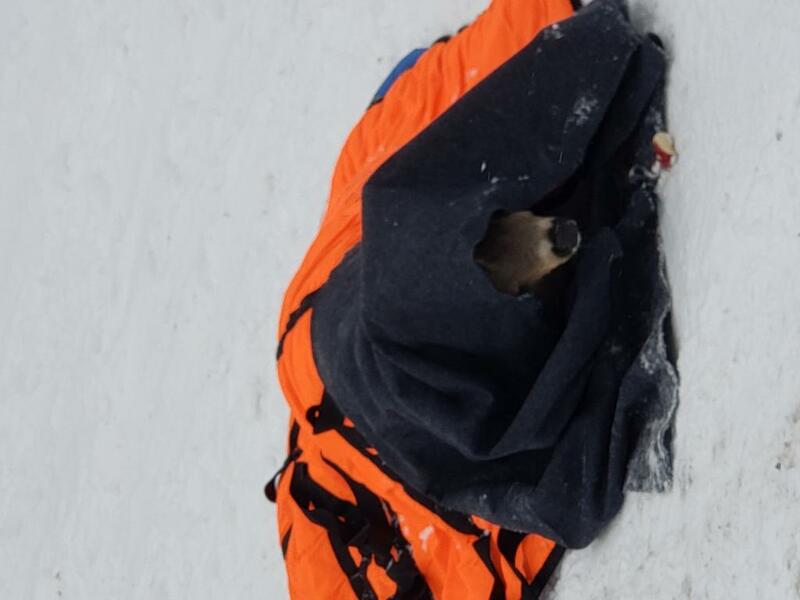 However, due to the location of the deer and serious concerns that untrained well intentioned civilians might attempt to rescue the deer, it was jointly decided that in the best interest of public safety an attempt to remove the doe from the lake by trained ice rescue personnel could be made safely. SLVFD ice rescue team responded with 10 members and two trucks equipped with ice rescue gear and one airboat. 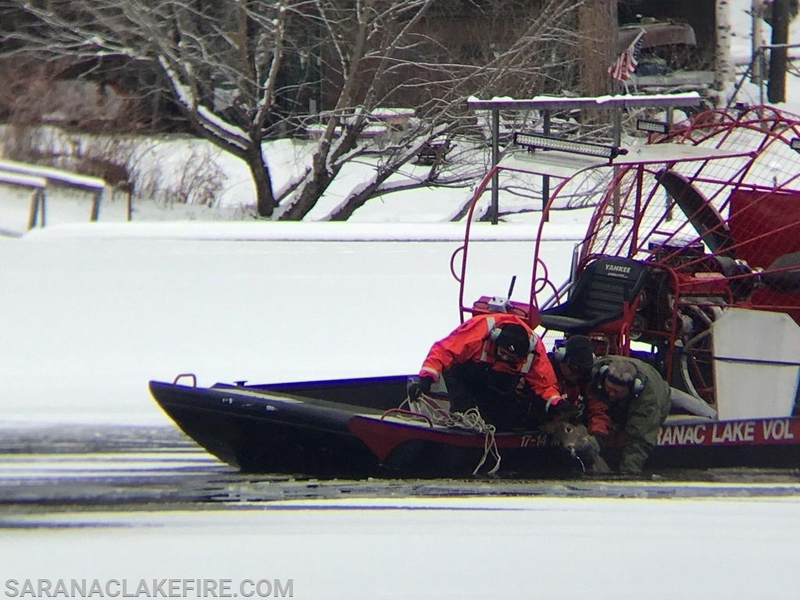 Three trained ice rescue members flew out in the airboat to access the doe's condition. An attempt was made to break the ice creating a path for the doe to swim to shore. It became obvious that she did not have the energy to swim to shore or get back on the ice shelf under her own power. The airboat crew then made the decision to attempt to assist her back onto the ice shelf. They carefully approached the deer, who was attempting to swim to the boat. 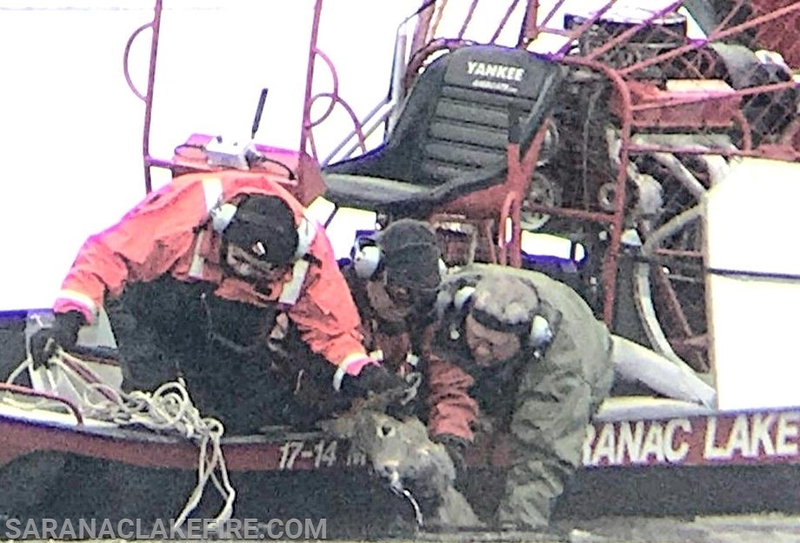 After moving some broken ice sheets out of the way the deer slowly swam towards the airboat, and the three ice rescue members then decided to attempt to pull the large doe into the airboat. She was totally exhausted and did not thrash or kick as the ice rescue techs pulled her into the boat. She was flown back to shore at the Lake Flower boat launch where NYS DEC, NYS ENCON, SLPD and SLVFD initiated attempts to rehab her. 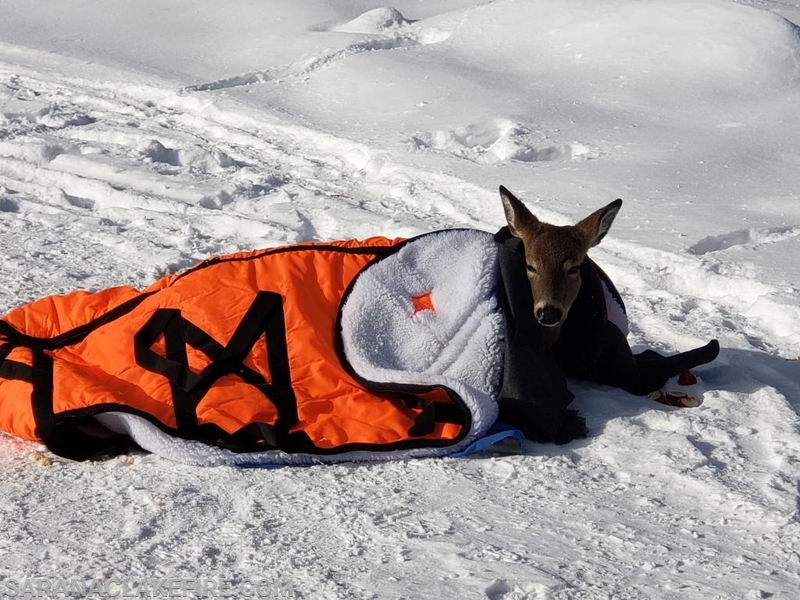 NYSDEC, SLPD and ENCON remained with the deer throughout the morning and early afternoon attempting to warm her up and let her rest and regain strength. After several hours it was decided to move her from the public boat launch parking area near the highway to a safe quiet supervised location to try and let her continue to recover. Unfortunately, despite the best efforts of all involved to rescue and rehab her, we are sad to report that she died this evening. SLVFD has responded to numerous ice rescues over the years, including family pets, especially dogs that get loose and fall through the ice. SLVFD cautions everyone that no ice is safe ice. Often untrained individuals will attempt an ice rescue and become victims themselves. Ice conditions are extremely poor and unsafe due to the thaw, heavy snow and re freeze cycle we have been experiencing. Please stay off the ice. Thank you. Sad news. She tried hard and everyone involved did their best for her. Well done all. Showed what we are about. Just wanted to say, after all of your hard work to save the deer, I am very sorry that the deer did not survive. I am sure it broke your hearts. Great job though on doing such a kind deed to all of involved. I am so sorry. You are kind heros. Best Regards. Great job, lots of hard work on a cold and windy day. Well done everyone!!!! Very sad news to hear. Still thank you very much for your caring attempts to save her life. It shows that we are a town that cares and we are willing to go the extra mile. Thank you SL Fire and Rescue!! We are lucky to live in such a caring community! Terribly sad the doe did not survive her submersion into the Icey Lake Flower water. I read the rescuers “ usually do not interfere” with such tragedies but I was so relieved and hopeful reading they did try. Kudos to all who made this attempt risking their own safety for her. To have just “left her” would have been terrible. Oh no this breaks my heart. She was a beautiful animal and I thought for sure she was going to make it. Thank you all for trying to rescue her. We all would want the same done for us and we are all lives, and all have worth. While is was disheartening that this deer did not make despite all the hard work of many volunteers, it is with great pride that l salute their valiant efforts. We as a small community are very lucky to have such caring and dedicated volunteers in our midst. The reasons given in this article no doubt saved other lives of untrained individuals from attempting to save this deer. This could have had a much more tragic outcome. A special thanks to all involved. So PROUD of our first responders, WE are very lucky to have them. I just read online about your attempt to rescue the Deer that fell through the ice on Lake Flower. Thank you all for your efforts for her. It was a valiant attempt to save her life, but just wasn’t meant to be. Thank you...without your dedication and caring, her last moments of life would have been terrifying and painful. Also, you all saved my Cousins house (Tom & Mary Lou Cassavaugh) in Bloomngdale this past week. We are all so grateful for your efforts, it could of ended so differently! 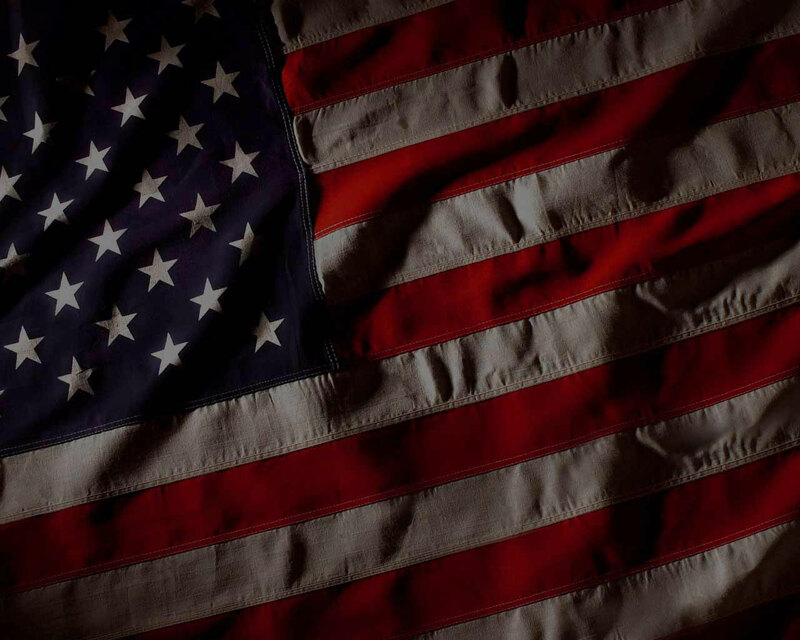 Thank you, thank you, thank you everyone for your all you do every day for others. You sooo matter to all of us! Poor baby. I hope a day will come when we no longer shoot them. They are gentle and innocent and deserve to live in peace.